Warning: the leaves of the rhubarb plant are poisonous. Wash rhubarb stalks and slice into one-inch pieces. Set aside. In a large bowl sift together: 1 C flour, 2 TBSP white sugar, baking powder, and salt. Slightly beat an egg and combine with milk. Mix egg into crumbs until moistened. Set aside. In a large pot, stir together: combine sugar, corn starch, cinnamon, water, and butter. Add rhubarb, stirring until all pieces are coated. Let mixture bubble, stirring occasionally, and cook 5-10 min. Pour hot fruit mixture into baking dish. 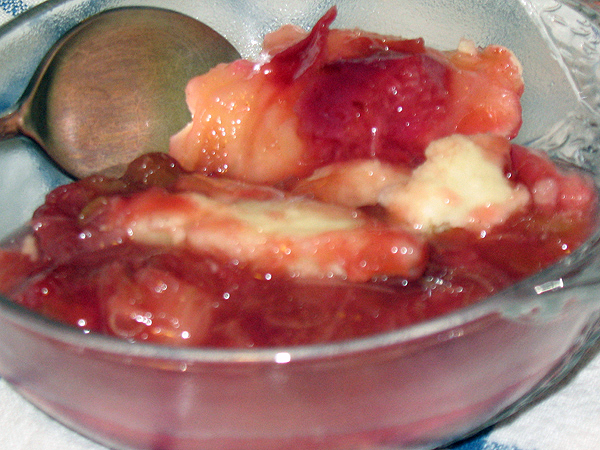 Immediately spoon topping onto rhubarb. After baking, cool on wire rack at least 20 min. Scoop and serve.